P.F. Chang’s Waikiki launched six new island favorite entrée items inspired by local Chef Tate Nakano-Edwards. This limited time offer (LTO) combines local seasonings, sauces and herbs with different cooking styles to create a great accompaniment to the standard P.F. Chang’s menu. A selection of specialty beverages and wines have been added to the LTO menu for the perfect pairing. • Crispy Coconut Prawns - $7.99– this tasty dish features prawns wrapped in coconut and won ton threads then lightly fried and served with a sweet plum sauce. • Garlic Prawns - $22.99 – prawns gently cooked in a rich garlic butter sauce accompanied with a pickled pepper slaw. • Cantonese Style Steamed Snapper - $29.99 – fresh snapper steamed with ginger, scallion and cilantro finished with hot oil and served in a savory black bean sauce. • Fried Snapper –$29.99 - fresh snapper fried to crisp perfection accompanied by savory sautéed oyster mushroom and a slightly spicy sauce. • Kalbi Jim – $24.99 - bone in short ribs braised in a sweet soy sauce flavored with finger, garlic and scallion until fall apart tender. • Kim Chee Fried Rice - $15.50 – fried rice seasoned with sweet and spicy kochujang sauce and locally made Kim Chee topped with two fried eggs, over easy. Chef Tate Nakano-Edwards, a Kaimuki local boy, has always loved food. After graduating from Kaiser High School he enrolled in Kapiolani Commmunity College’s Culinary program. While at KCC, he was part of the 2009 American Culinary Federation National Championship team that took 1st place out of 400 other teams from around the nation. Currently, Chef Tate is the Executive Chef at the Honolulu Baking Company and an ACF Certified Executive Chef Candidate. P.F. Chang’s served Spam Lettuce Wraps and Spam Lo Mein at the Annual Waikiki SPAM JAM® event. 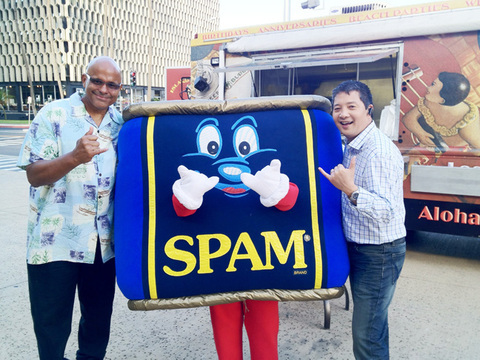 SPAM JAM is a street festival that celebrates the people of Hawaii’s love for SPAM®, a canned meat from Hormel Foods. In Hawaii, you will find SPAM® at all grocery and convenience stores, many restaurants and in most homes in Hawaii.